In the words of my 7 year old "It was hot, but it was awesome", after our visit to Kid Factory in Dingley Village. My sons and I ventured to Kid Factory on the very first day of opening; Wednesday 13 January 2016. This also happened to be a sweltering 42 degree day. It is near impossible to keep a warehouse cool on such a hot day, but the boys loved it anyway. 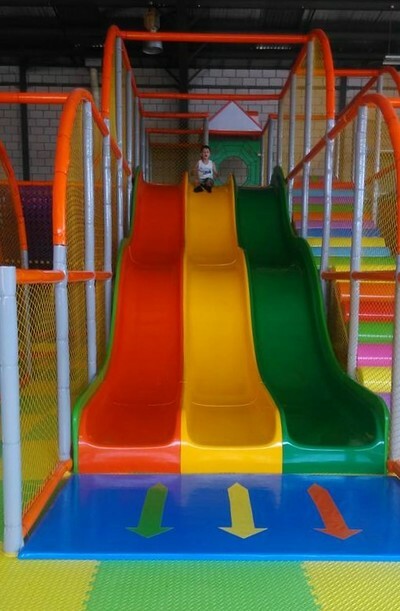 Indoor playgrounds have come a long way since my childhood. Now you can choose to visit super-sized indoor playcentres, trampoline parks, inflatable play zones and kid-friendly indoor sports gyms. Kid Factory differs, because it combines all of the above in one warehouse. 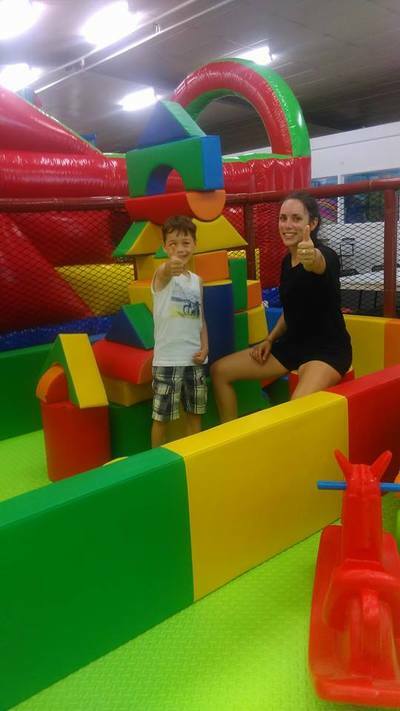 Kid Factory is literally a factory of fun, with ample play equipment such as ball pits, slides, soft play, tunnels and cubbies to explore, a trampoline zone, designated toddler play area, a large inflatable and ball sports in a court to the rear. 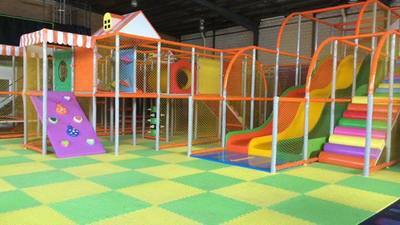 What I liked about Kid Factory, is not only the variety of fun to enjoy, but also the age range suitability. 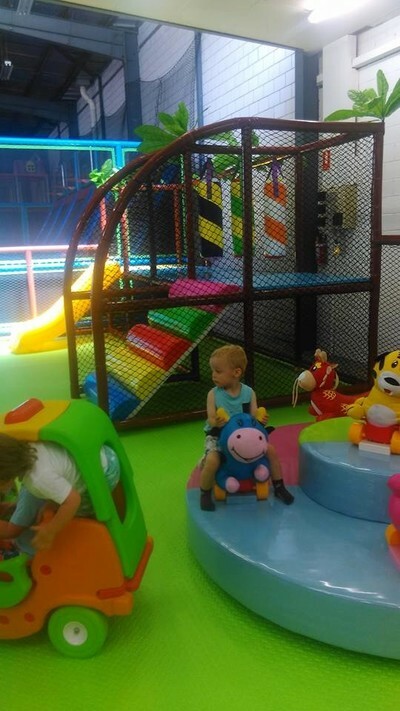 My 2 year old very much enjoyed playing in the toddler zone, complete with soft building blocks, small slides and a cute little animal merry-go-round. My 7 year old loved jumping on the trampolines. Kid Factory staff dressed in black t-shirts are scattered throughout the centre. 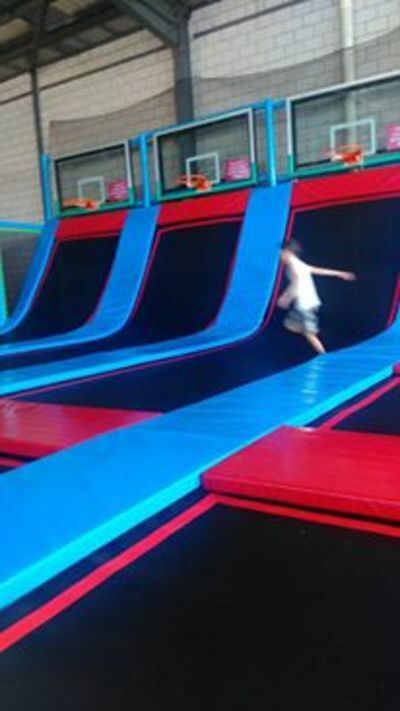 I hardly saw my 7 year old because a Kid Factory helper in the trampoline zone entertained him and a group of kids for well over an hour, playing ball games and challenges. Let's talk about the food; usual indoor playground options such as hot chips, nuggets and sandwiches. You can also order salads if you want to, and coffee of course. Kid Factory is vast, but not too big that you'll loose your toddlers (always an issue with my little runner). Tables and chairs are ample, and there is a nice designated feeding / changing room for babies. Kid Factory party packages are available. There are themed party rooms decorated in superheros, Ninja Turtles and Tinkerbell, not forgetting Peppa Pig for the wee ones. A website is coming soon, in the meantime head to Facebook for all the latest updates HERE. Entry costs: $10 - Under 2 years. $12 2 years plus. No fees for babies or adults.